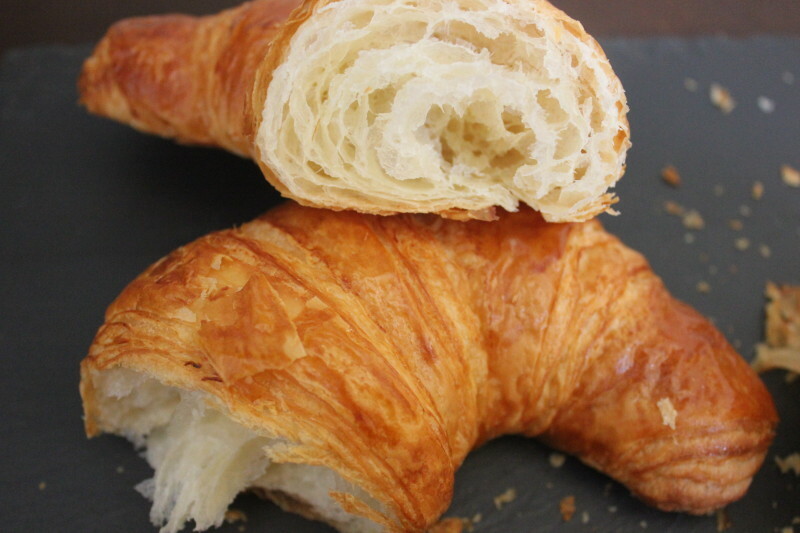 In celebration of National Croissant Day, I would have preferred to eat my way through Parisian boulangeries but felt as though I would be doing a disservice to my fellow Dallasites. 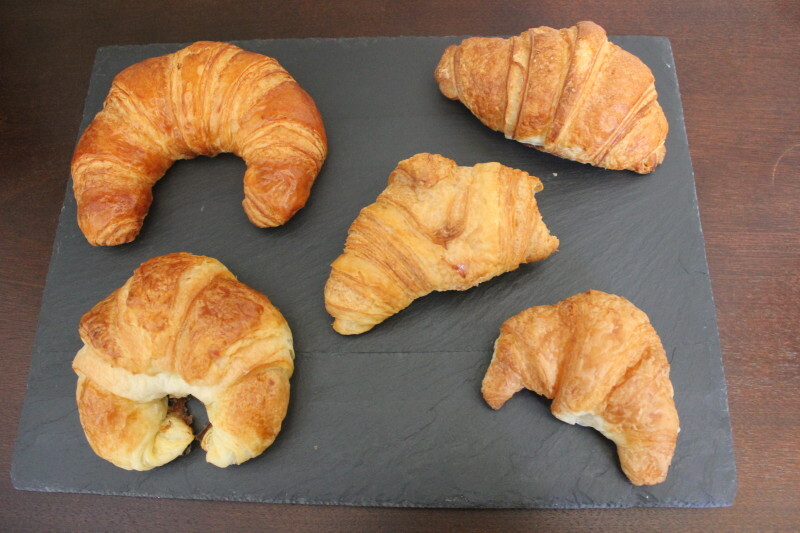 So I ventured out to a few local spots in search of the best croissant in Dallas. As you can see, they come in all shapes and sizes. But I won’t discriminate on these merits. Instead, I’m looking for a crispy, flaky exterior, a light and airy interior, and a delicious buttery flavor. Starting in the lower left, heading clockwise, and ending in the middle, I procured these beauties from EatZi’s, Empire Baking Company, Village Baking Co., Whole Foods Market, and Central Market (I got little excited on the way home and took a bite out of this one before the photo shoot). I wanted to check out the texture and crumb on the interior so I broke into each of them to see what was going on. Perhaps a clean-cut cross section would have been more revealing, but I couldn’t wait to get my hands on these (literally) so a good tear did the trick. This closeup shows the interior of Empire’s take on this French favorite. To me, this is how a croissant should look on the inside: vaguely concentric circles with lots of airy holes surrounding them. Not surprisingly, I found Empire’s croissant to be the lightest. While that was heavenly, it wasn’t particularly crispy on the exterior and lacked that buttery flavor you really want in a croissant. 1 for 3 won’t get the job done. In addition to also lacking a crispy/flaky exterior and buttery flavor, EatZi’s version was quite dense and required much more chewing than a croissant should. Enough said. 0 for 3. On to Whole Foods. Their take was light and airy but not crispy or flaky. At all. No crunch as you bite through that exterior. Instead, it just sank between my teeth until smooshed to oblivion. The flavor was better but not there yet. 1.5 for 3. The other grocery store version from Central Market was a step in the right direction. 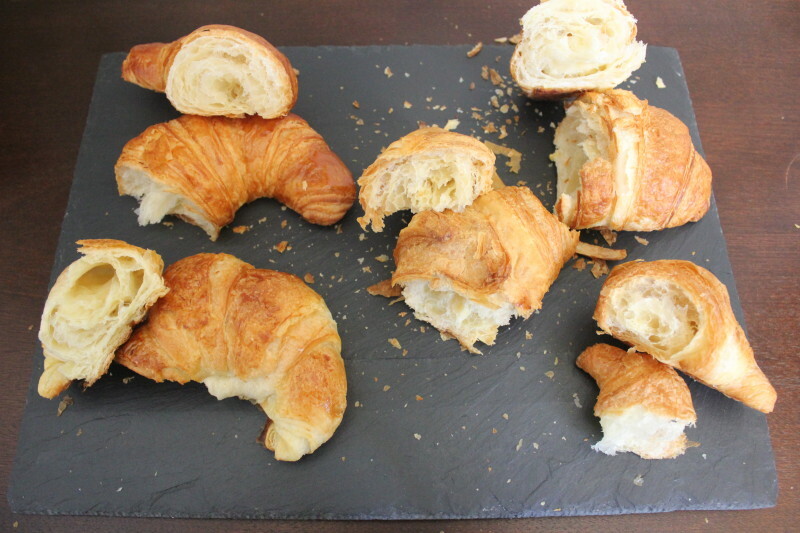 While slightly a bit dense inside for my liking, the exterior had a nice crunch and lots of flaky layers (the end goal: to have small pieces of flaky croissant all over your face and shirt when done). And finally, the buttery flavor I’d been looking for! 2.5 for 3. Last but not least, Village Baking Co. The texture of this version was sublime. Super crispy and flaky on the outside and nice and light on the inside. Unfortunately, Village’s croissant came up short on the butter flavor. It was there, but not quite as good as that of Central Market. Another 2.5. In the end, do you go for the flavor or the texture? I suppose you could get a croissant from Village and just spread on a little butter of your own. Are you judging me?…for adding more butter to an already buttery pastry? I didn’t think so. And while you’re at Village Baking Co., pick up a pretzel croissant if you’re into salt. It will change your world. You can thank me later.